Horn Model 60 Corner Caddie Pro $1,459.00 - FREE SHIPPING! Usually leaves the warehouse in 10 - 14 business days. Expedited shipping is not available. Available in White, Sunset Oak, Sunrise Maple and Sunset Maple. The biggest waste of space in any sewing room is always in the corners; with the Horn Model 60 Corner Caddie Pro, all that space can be put to great use. Designed to serve as a corner work and storage surface to connect other Horn cabinets into one conjoined unit, the Horn 60 corner cabinet provides essential tabletop workspace and storage space every sewist needs. 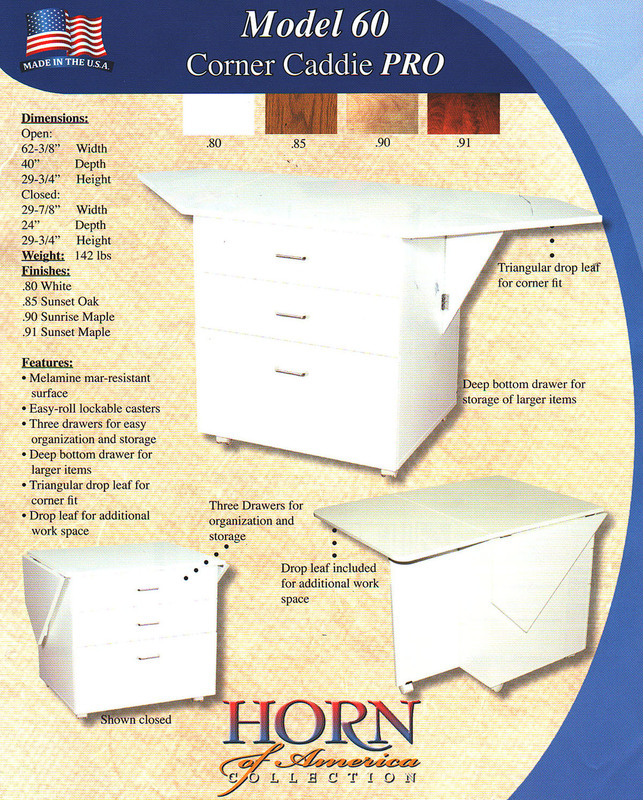 The Horn Model 60 cabinet is a unique storage piece; it can be used standalone, set up between components in a line, or set up in a corner with its two triangular top leafs extended. The triangular leafs setup to create a continuous, flat work surface around the corner for convenient and more efficient use of available space. The dimensions of the cabinet are 29 ⅞” wide x 24” deep when the leafs are down; with the leafs up, the top surface dimensions are 62 ⅜” wide x 40” deep from leaf point to point. It stands 29 ⅞” high to match most of Horn’s other cabinets and components. There is also a square drop leaf in the rear that extends the workspace even further and matches other components with a rear drop leaf. The Model 60 Corner Caddie has 1 deep bottom drawer and 2 smaller drawers above it, providing plenty of space for organizing and storing items of different sizes. The cabinet is made with a mar-resistant melamine finish and has locking Easy-Roll casters for easy maneuvering. It is available in 4 finishes: white, sunset oak, sunrise maple, and sunset maple; the cabinet weighs 142 lbs. 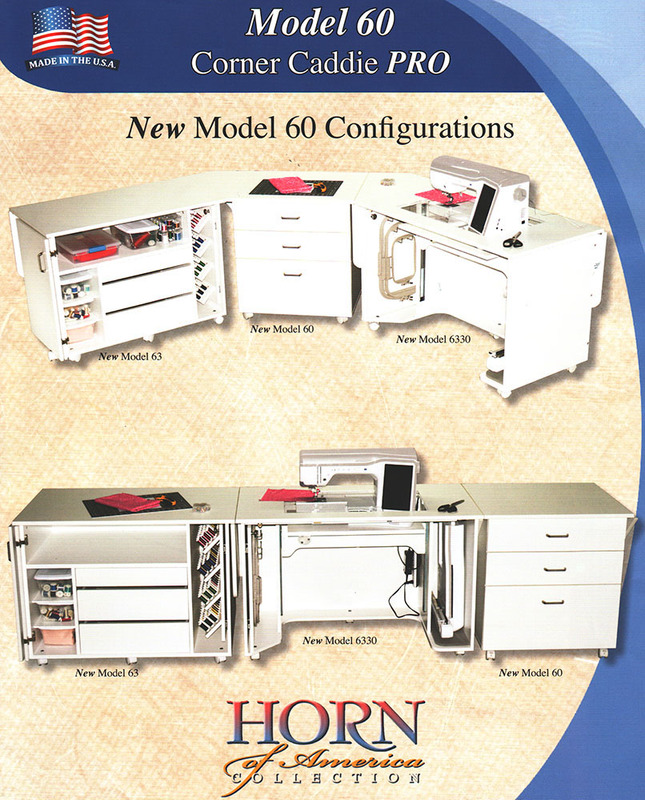 The Horn Model 60 corner cabinet is made in the USA in Horn’s production factory and ships fully assembled plus it is covered by Horn’s Lifetime Warranty. The Horn Model 60 Corner Caddie Pro - The Perfect Storage Companion to Compliment Your Horn Cabinet Setup! Haven't tried your New Horn Model 60 Corner Pro but if I use it as the corner piece in a grouping holding my serger, where do I put my legs?